Finnegan Begin Again: Talk about good deeds: Look what I got! Talk about good deeds: Look what I got! Well, friends, I got the best birthday present EVER yesterday. 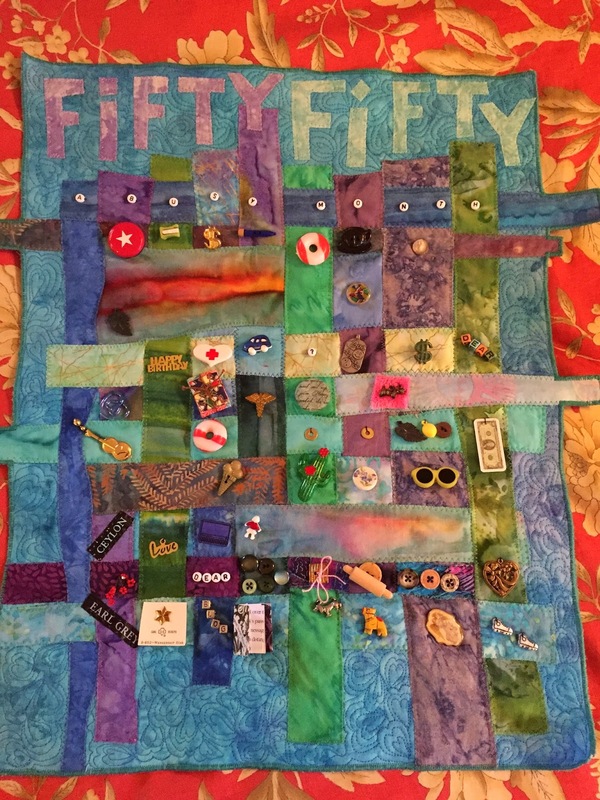 It is the beautiful quilt square celebrating my fifty good deeds for fifty good years. Every single doodad on it symbolizes one of my good deeds. They are even in the order which I deed them. And, for when I have lost my marbles, on the back there is a little quilted envelope that holds a copy of my blog post noting each and every one. Don't you love it? It was made by my dear friend Cathy Perlmutter, who has her own fabulous quilting blog. You can find it here. She is actually an amazing artist and craftswoman, and she is hysterical to boot, as her last few posts demonstrate. Her daughter is one of my Girl Scouts, and she is my younger girl's oldest and dearest friend. Cathy's daughter is a tremendous artist as well. She sings, plays the cello and guitar, acts, draws, and will one day win all the big writing awards. I will feel forever amazed that I knew her, and I will also no doubt feel somewhat ashamed that my own talents never quite matched hers. It will be a horrible sting for me, and I will try hard not to hate her, as I am inclined to hate everyone more successful than I (which is leaving me an increasingly small pool of people to like, I assure you). I will fight my petty feelings as best I can, but I worry the whole things will end somewhat poorly, with me feeling bitter and jealous and then, of course, ashamed of feeling bitter and jealous. I will try my best to hide my bitterness from Cathy, who will, I am sure, at least be modest about her daughter's National Book Awards and Nobel Prize. Oh my God. I just had a thought: What if Cathy's daughter wins the Nobel Prize for Literature and her son wins the Nobel Prize for physics or chemistry or something (he is an incredibly brilliant Harvard student). Will Cathy be able to maintain the modesty of being a two Nobel mother? Hmmm. I think I would become the most obnoxious person you'd ever met. I think you would all hate me, and then I would laugh at you all hating me, and I would say "Too bad for you, all you people whose children will never win Nobel prizes." But, see I am petty that way. Cathy: That is your burden. I wish you well with it. I love my present. And I love my friends. Boo! My blog cut off part of the quilt, but I want to keep it big so you can see the doo dads. Thanks to your Fifty Deeds, when my children win Nobels and hand their winnings to me (because they are perfect children), I will leave larger tips and buy more donuts and coffee for strangers and give more money to the homeless and hide dollar bills in the Dollar Store and in public parks (I'm still working up to some of these). You are a true menche, Margaret, and a hero, and an inspiration, today and always. Shush it, Cathy. I'm not listening. But it is true that your children are perfect. A superb gift for a superb person from a superb person with superb children! It's too much, too much, I tell you. But take it anyway, Margaret. There's nothing like it. I love it. Fabulous and you are right, you won't forget, and whoever is lucky enough to have it after you, will have a record of this time. Such a prize-worthy work of art! The colors are making the day ahead look really good right now. That was a fabulous gift indeed...even though I do find talented and perfect people quite obnoxious and I am glad you went where you did with your post so I don't feel completely alone in my bad-person-jealousness. What a lovely gesture. That's a true friend! The only thing better in life than a good friend is a great friend. What a wonderful friend! And such a great quilt commemorating your good deeds! You're so funny, Margaret, this was such a laugh. Cathy must be a brilliant quilter to be able to make one so quickly. If I'd made you a quilt, it would be one celebrating your high school exam results - it'd have taken me till now to get it done.